A couple weeks ago was my cousins son's birthday. He turned 7 and just started first grade. One of his favorite things is Lego, so I wanted to make him something special with a Lego design. I looked around the web and found a cute T-shirt idea here and here. I think the felt is really cute, but I have been dying to try out freezer paper stenciling ever since I started sewing, and my mom just came for a visit and brought me four boxes of freezer paper (I can't get it here). 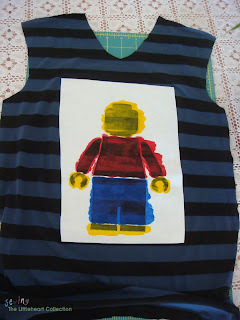 So I took the idea of the Lego Man t-shirt, and painted the man on with fabric paints using a stencil. Unfortunately I didn't realize that fabric paint does not show very well on dark fabrics (at least the kind I have) so I was a little disappointed when I applied the paint. I did do three layers though, which made it look much better. Then my mom suggested sewing around the edges with embroidery thread to enhance the Lego Man a bit and make him "stand out". So I did, and I love the way it turned out! You want to make one? This is how! Print out your Template on a piece of paper. I found the Lego Man in google images (I think I typed in "Lego Man Template"). Trace your template to your freezer paper. 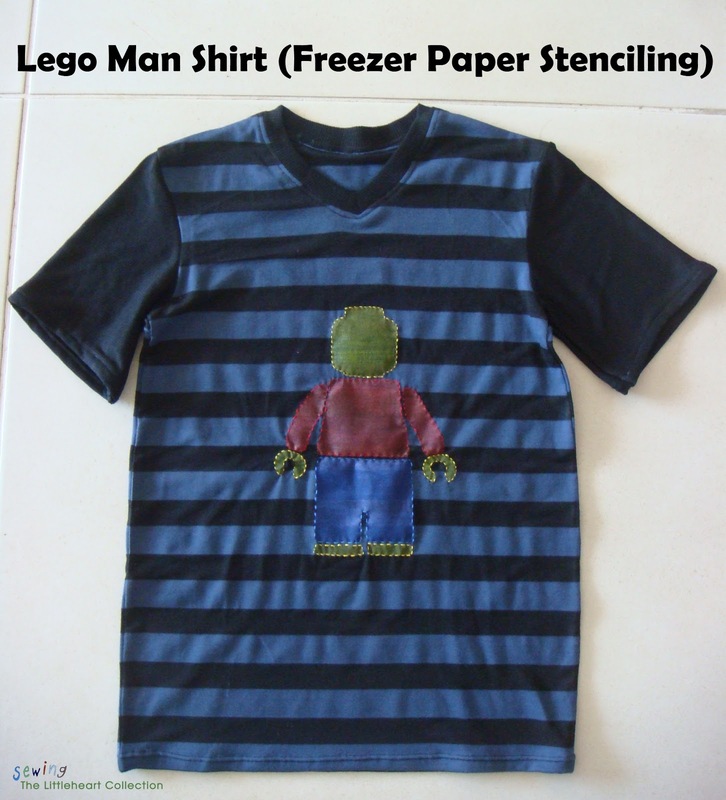 Place your freezer paper on the front of your t-shirt and iron on. If you are using an already made t-shirt, make sure to put some cardboard between the front and the back, so the paint doesn't soak through. If you are making your own t-shirt (like I did) then you can do the stenciling before you sew together the shirt. Color in the different parts with the colors you want. I had to let each layer dry and then paint over it again - three times. If you are using a lighter color shirt you probably do not have to do that. Take off the frezzer paper and let the paint dry. 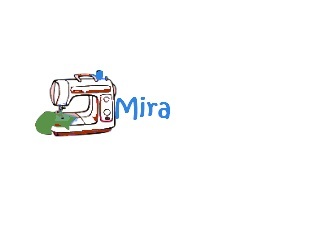 Now take out your embroidery thread in matching colors with your paint, and stich around every "piece of the puzzle". 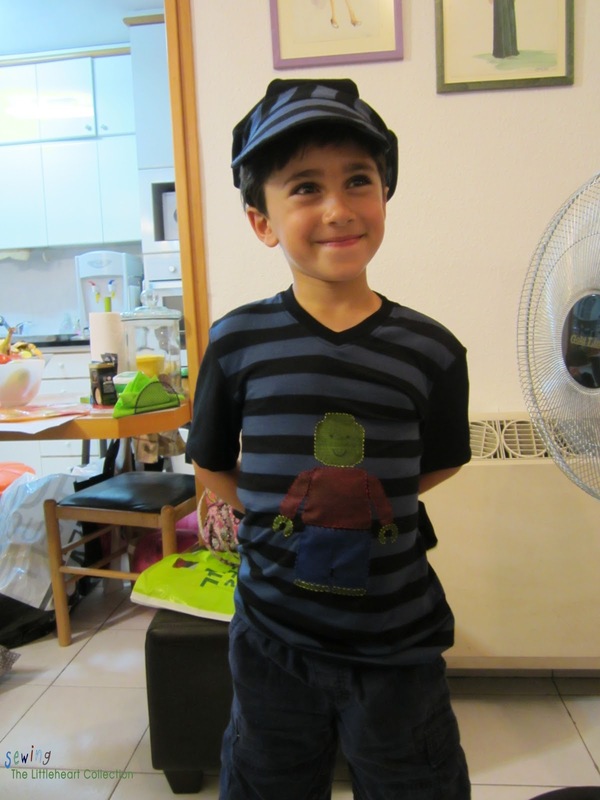 Sew together your shirt and make a little boy (or girl) very happy! 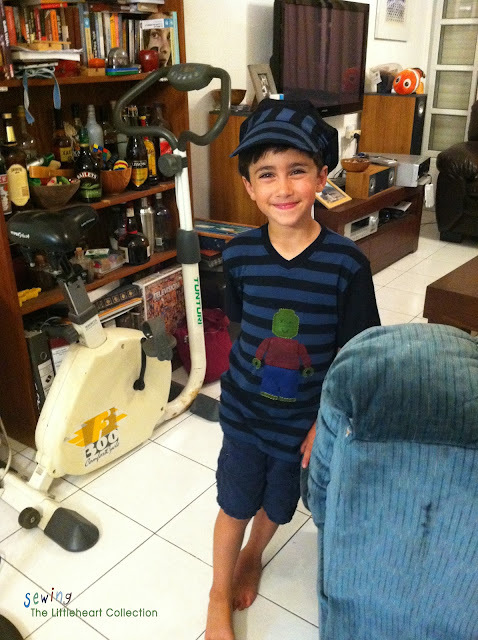 Like I said, this was a birthday present for my cousin's son, so I made a matching hat to go with the shirt. I love this hat pattern, it is a free pattern from Aesthetic Nest. I have made many versions of it, and i think it turns out great every time. Give it a try! Oh, and I also drew some eyes and a month on with fabric markers, but only later after I took the pictures! I will be linking up to some of the link parties on this page . In addition I am finally joining in on the Project run and play sew along and will be linking up to their flickr group for boys week. I love freezer paper but what a cute shirt!!! 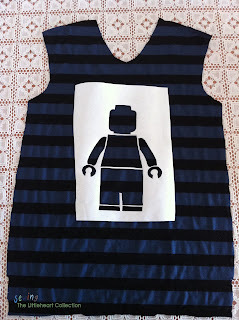 My middle two sons' school theme this year is with Legos, so this is perfect! Thanks for sharing such a great tutorial. Thanks for the link back- I love your version! The embroidery thread really does make it pop! Great job! I love the design. Thanks for sharing. Freezer paper stencilling is so much fun. I am keen to do some more in the next few weeks. I'd like to add the extra stitching like you, for something a bit different. Thanks for stopping by, Claudia! Would love to see what you make! Lego man shirt is adorable. 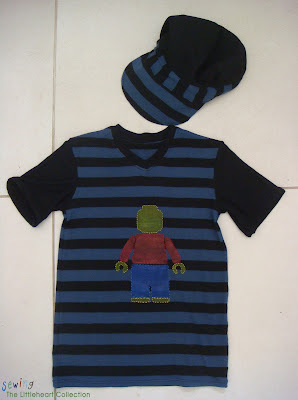 I love all that tiny embroidery on t-shirt! very cute. I heard to paint white on before the colors to help it stand out more.